Although this drink is imported from France, it is considered to be as much a part of the Persian Culture as Tea, adjil and Pistachios. hot chocolate powder for dusting. Make the espresso coffee and while still hot, stir in the sugar to mix. 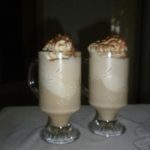 In two tall glasses, place 2 scoops of ice-cream in each glass, and pour the coffee mixture over the ice-cream. Add enough cold milk to fill the glass about 1cm from the top. Add whipped cream and dust with chocolate powder if desired. The espresso coffee and milk can be mixed and stored in the refrigerator in advance, and then poured over the ice-cream as required.